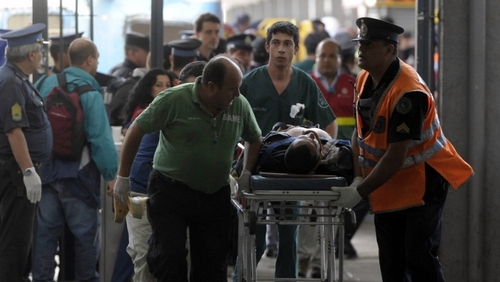 At least 49 people have been killed and over 600 were injured when a packed commuter train crashed in Argentina. State news agency Telam reported that more than 800 passengers were aboard the train when it hit the end of the track in Buenos Aires' Once station during morning rush hour. The commuter train came in too fast and hit the barrier at the end of the platform, smashing the front of the engine and crunching the leading cars behind it. Argentina's transportation secretary JP Schiavi said one car penetrated nearly six metres (20ft) into the next. Passengers said windows exploded as the tops of train cars separated from their floors. The trains are usually packed with people standing between the seats, and many were thrown into each other and to the floor by the force of the hard stop. The 28-year-old driver remains in intensive care. Officials said it is suspected that faulty brakes were to blame for causing the accident.